It takes serious balls to claim you're the most interesting man in the world, but the current Dos Equis spokes-character is trying his darndest. Played by Jonathan Goldsmith and narrated by Frontline's Will Lyman, The Most Interesting Man in the World is an ad campaign featuring a suave 50-60 year-old man who, among other things, bench presses women in short skirts and frees grizzly bears from traps while wearing a suit. The campaign, by marketing firm Euro RSCG, creates a remarkably elaborate mythology. A visit to the campaign website reveals all kinds of extra goodies, such as The Interesting Academy, where you can learn to bluff and/or circumnavigate the globe and some sort of live, touring show. There's also a feature called Behind Interesting, which are short, musical videos about people who wish they were as interesting as the Most Interesting Man in the World. And, as any good internet celebrity should, he has a Twitter-impersonator. Why is The Most Interesting Man In the World bench-pressing nurses? Because he can. The most interesting thing about the commercials is that MIMITW never really commits to promoting Dos Equis — the closest he comes is with the tag line, "I don't always drink beer, but when I do, I prefer Dos Equis." Sometimes, when he damn well feels like it, he will drink the beer he's selling. Dos Equis is obviously promoting an image here more than the product itself, but how helpful is it if the image doesn't necessarily use the product? Whatever, the ads are totally awesome. But we'd bet money that he's a scotch man. What is known about the Most Interesting Man in the World? "The police often question him just because they find him interesting. His beard alone has experienced more than a lesser man's entire body. His blood smells like cologne. He is the most interesting man in the world." "He's been known to cure narcolepsy just by walking into a room. His organ donation card also lists his beard. He's a lover, not a fighter, but he's also a fighter, so don't get any ideas." "His reputation is expanding faster than the universe. He once had an awkward moment, just to see how it feels. He lives vicariously through himself." "His charm is so contagious, vaccines have been created for it. Years ago, he built a city out of blocks. Today, over six hundred thousand people live and work there. He is the only man to ever ace a Rorschach test. Every time he goes for a swim, dolphins appear. Alien abductors have asked him to probe them. If he were to give you directions, you'd never get lost, and you'd arrive at least 5 minutes early. His legend precedes him, the way lightning precedes thunder." "His personality is so magnetic, he is unable to carry credit cards. Even his enemies list him as their emergency contact number. He never says something tastes like chicken. Not even chicken." MIMITW on packages: "Fellas. Leave the tight pants to the ladies. If I can count the coins in your pocket, you better use 'em to call a tailor." MIMITW on life: "It's never too early to start beefing up your obituary." MIMITW on pick-up lines: "There's a time and place for them. The time is never. You can figure out the place on your own." MIMITW on the two-party system: "The after party is the one you want to attend." MIMITW on careers: "Find out what it is in life that you don't do well, and then don't do that thing." MIMITW on roller blades: "No." MIMITW on mixed nuts: "See those nuts? They are there to make us thirsty. While I don't like being coerced, in this case I shall make an exception." "People hang on his every word, even the prepositions. He could disarm you with his looks... or his hands. Either way. He can speak French... in Russian." MIMITW on self defense: "The right look should suffice." dont these sound eerily similar to Chuck Norris jokes? Definitely Ernest Hemmingway in those ads. Great campaign though. That actor is 71, according to an internet search I just did. These ads just make me want to grow a beard. I already drink Dos Equis. A rabbit rubbs his leg for luck. Please keep archiving these. I sit in my office and laugh once a week. He is just so damn interesting! Best ad campaign since the Mac/PC guys, and I think I like these even better. Thanks for compiling them. This guy is my hero. Who WOULDN'T want to be THAT guy? Love the commercials! everyone wants to be him. i have found something very interesting about him, check it out here http://dosxxquotes.blogspot.com/. 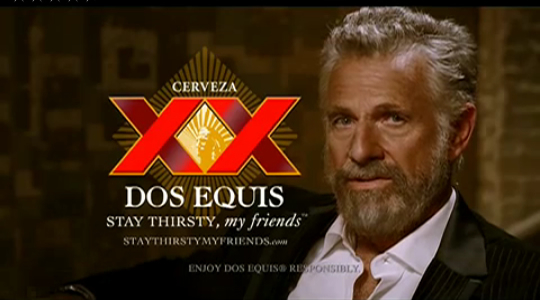 CRAP, the damn ad's work, now I'm drinking Dos Equis so I can keep Johnathan Goldsmith employed. I hope if he sees me he buys me a drink.